you know, if you've been reading for awhile, that i love perfume. i recently read this piece about finding your personal scent in the lenny letter. and it's all about layering. even before reading this, i had taken to combining a couple of scents - at the moment, it's been a rather unorthodox combination of the sweetness of for her by narciso rodriguez and the spicy, greenish masculinity of vetiver insolent by miller harris, but it's felt like the right scent for me at the moment. i was relieved to read in the article that a note or two of something rancorous is in fashion, since this cold, damp summer combined with living in our old farmhouse, my personal scent is surely laced with a healthy dose of mustiness from the damp that seeps up through the brick walls thanks to high ground water. there's probably also a dash of litterbox needing to be changed and perhaps a vague aroma of spilled coffee thrown in, which may be a note or two too many of rancour. 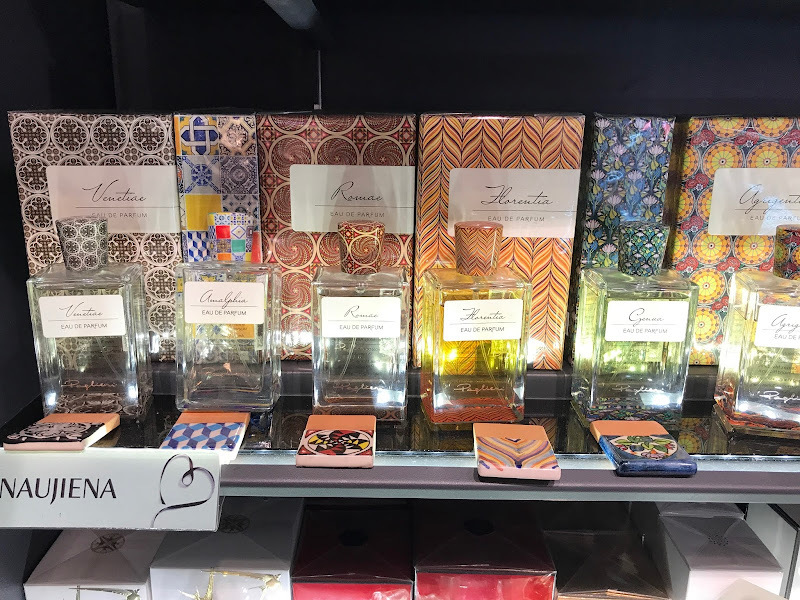 when we were in lithuania, i ran into these beautiful scents, named after italian cities, in a high end perfume shop. i'm not even sure who makes them. i tend to have trouble with scents and my own body chemistry, as they can turn rather nasty on me, especially if they are full of synthetic ingredients. but i tried, over a couple of days, four of these gorgeous scents and they all just got more beautiful on me. tho' at €149 per bottle, i didn't buy one, having decided we were having a vacation experience, not a vacation shopping trip. but, i may have to try to find them again and buy one, as they were just gorgeous. the packaging is simple and elegant as well. they have everything one could hope for in a scent. maybe this autumn..i think florentia would be lovely when paired with the dusky scent of autumn leaves.